In celebration of Sys Admin Day I bring to you the Star Wars theme song via PowerShell! 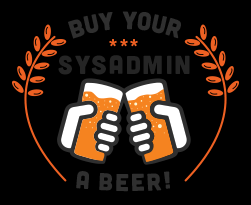 Oh and don't forget to buy your Sys Admin a beer. All Sys Admins Like beer! Here's a little PowerShell script that plays the Super Mario Theme Song!! I hope you enjoy this as much as I enjoyed making it!! Has you company recently moved to a new location? If so here is a script to modify the "StreetAddress" Active Directory attribute for multiple users at once. Set-ADUser -Identity $user.distinguishedName -StreetAddress "1600 Pennsylvania Ave NW"
This could be used to modify any of the Active Directory attributes by simply editing the -property being queried.